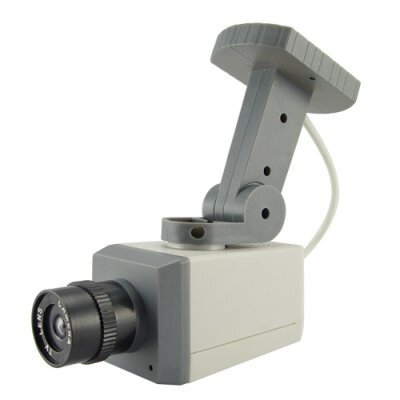 Successfully Added Dummy Security Camera with Motion Detector and LED Light to your Shopping Cart. Fake security camera with motion detection and flashing LED light to make it appear like an active security camera. Sometimes just the presence of security cameras prevents any harm or robbery from taking place. This fake but realistic looking security camera comes with two important features that deceive a potential criminals mind. First, with its motion detection feature it will operate when someone or something passes in front of it, so the camera starts to pan left and right, making it appear as a working video surveillance camera. In addition, it also has a flashing LED light, so it will appear that the camera is currently video recording activity. With it realistic appearance and motion functions there is no way for anyone to know that they are looking at a fake! This is a great product for resale or anyone looking to quickly DIY upgrade the security around their small office. We are offering this product in an order quantity of at least 5 pieces in order to give you the absolute best re-sale profit margin from our low wholesale price and even better shipping rates. Fake security camera with motion detection panning movement and flashing LED light. Easy installation, no wiring necessary. The perfect weekend DIY project! Does this product record video? - NO. This is a fake camera meant to appear like a real security video camera. Does this product automatically move? - YES. This unit pans left and right just like a real camera when it detects motions.